Bukowskis – where the collections are sold! 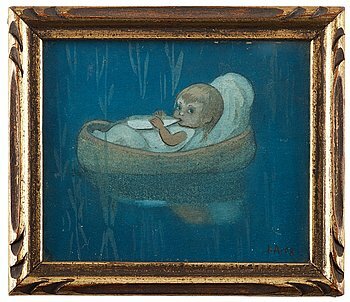 Bukowskis has the honour of presenting one of Sweden's most prominent private collections at the "Important Spring Sale" taking place June 7-8th: Hans Erik Börjeson Collection. 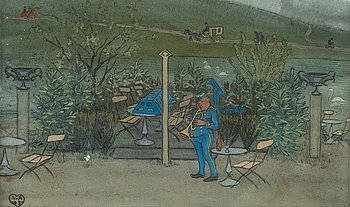 The collection has previously been exhibited at “Greenverket” in Tällberg and contains several significant works by Swedish master painters such as Anders Zorn, Carl Larsson and Carl Kylberg, whom together with international artists like Pablo Picasso and Marc Chagall are represented in this highly personal and dynamic collection. Carl Kylberg: ”Sunrise in the garden”. "Living with art and having the opportunity to share it, as we’ve had the opportunity to do through “Greenverket” in Tällberg, has been a true joy and something that enriched my entire life. Through art I have met friends for life and I have always felt a very close connection to the art. Now I hope the art works can give the same joy and inspiration to someone else, who can also secure its future and place in history. Who knows, maybe we'll see a work of Zorn at the Zorn Museum in Mora in the future, it would have been amazing", says art collector Hans Erik Börjeson. When Zorn paints "On the Beach S:t Ives Cornwall England” in 1888 he stands at the peak of his career as an internationally acclaimed and established artist. The artwork was from the beginning acquired by the Prime Minister, baron Gustaf Åkerhielm, and has not been out for sale since it was auctioned at Bukowskis in 1968. "After more than 30 years of friendship, it is an honor to be involved in the sale of these masterpieces. It has been a true pleasure to see this amazing art collection shaped over the years and through it, getting to know Hans and his exceptional eye for art. Especially "On the Beach St Ives Cornwall England” has been in mind over the years since the very first time I saw it. The collection at “Greenverket” has given me an art experience beyond the ordinary and I am extremely grateful for the many and long conversations about art that took place during my stays at the Green Hotel and Hotell Siljanstrand in Tällberg", says Anette Granlund, specialist Bukowskis. The collection took shape at the beginning of the 1950s, and has through the years developed into a collection of institutional character, including artworks by artists from different decades and from different nationalities. The viewing at Bukowskis classic premises at Berzelii Park in Stockholm offers a great opportunity to observe these artworks before they are offered at auction during "Important Spring Sale". The collection will be part of the art history and the printed premium catalog, a document describing a fantastic contribution to the art world, saved in antiquarian and the Royal Library for future art historians. We are very proud to once again get the honour to sell one of Sweden's finest art collections, says Andreas Rydén, head specialist art, Bukowskis. 300. 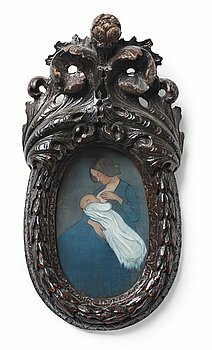 Ivar Arosenius, ”Mor och barn” (Mother and child). 301. Ivar Arosenius, ”The Bridegroom Dressed”. 302. 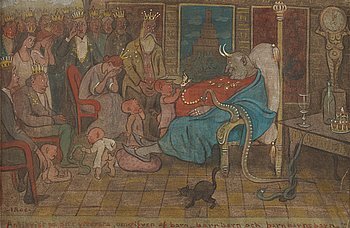 Ivar Arosenius, ”Antichrist at Death’s Door, Surrounded by Children, Grandchildren and Great Grandchildren”. 303. Ivar Arosenius, ”Moses i vassen” (Moses in the reeds). 304. 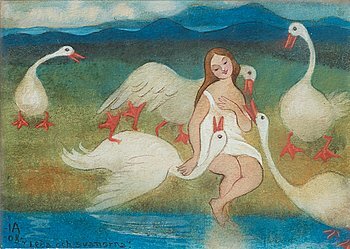 Ivar Arosenius, ”Leda och svanorna” (Leda and the Swans). 305. Ivar Arosenius, ”Susanna och gubbarne” (Susanna and the Elders). 306. Ivar Arosenius, ”Orkester. Motiv från Slottsskogen, Göteborg” (Orchestra. Scene from Slottskogen [Park], Gothenburg, Sweden). 307. Ivar Arosenius, ”Guldkalfven” (The golden calf). 308. Ivar Arosenius, ”Under stora trädet” (Under the large tree). 309. Ivar Arosenius, ”Gravvård” (Gravestone). 310. Ivar Arosenius, ”Porträtt av Axel Törneman” (Portrait of the artist Axel Törneman). 311. 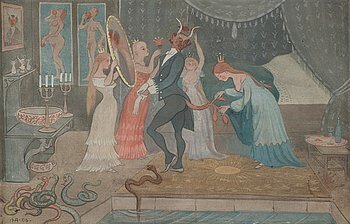 Ivar Arosenius, ”Paradisets lustgård” (The Garden of Paradise). 312. 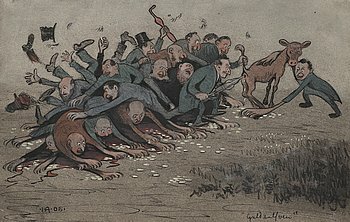 Carl Larsson, ”Från 30-åriga krigets dagar” (From the days of the Thirty Years' War). 313. Carl Larsson, ”Brita, en katt och en smörgås” (Brita, cat and sandwich). 314. Carl Larsson, ”Illustration till ’Kabale und Liebe’ ” (Illustration for ”Kabale und Liebe”). 315. Carl Larsson, ”Illustration till ’Kabale und Liebe’ ” (Illustration for ”Kabale und Liebe”). 316. Carl Larsson, ”Illustration till ’Kabale und Liebe’ ” (Illustration for ”Kabale und Liebe”). 317. Carl Larsson, ”Våridyll” ("I grönan lund"/"De badande barnen"/"Idyll") [Spring idyll]. 318. Sigrid Hjertén, French landscape / Le Midi. 320. Nils Tydén, View over Riddarfjärden, Stockholm. 321. Olle Olsson-Hagalund, ”Motiv från Bellevue” (Scene from Bellevue [Park], Stockholm). 322. Einar Jolin, Sleigh Ride. 323. Einar Jolin, Winter scene from Stockholm. 324. Carl Kylberg, ”Soluppgång i trädgården” / ”Morgonsol i trädgården” (Sunrise in the garden / Morning sun in the garden). 325. Carl Kylberg, ”När rönnbären mogna” (When the rowans ripen). 326. Axel Fridell, ”Uti världen” (”Fyra vandrande män, en sittande man med hund”) [Out into the world]. 327. Axel Fridell, ”Två herrar vid stranden betraktar ekorre i träd” (Two men by the beach watching a squirrel in a tree). 328. John Bauer, I am the man who collects shadows. Will you give me your shadow tonight?. 331. Oskar Bergman, Spring landscape from Ersta. 333. Anders Zorn, "Skräddarmästare Boberg" (Tailor Boberg). 334. Anders Zorn, ”Frukost i det gröna” (Breakfast in the garden / Wholesale dealer Adolf Magnus). 335. Anders Zorn, Portrait of Mrs Milda Klingspor, born Weber (1864-1926). 337. Maurits Cornelis Escher, ”Between St Peter's and the Sistine Chapel”. 338. 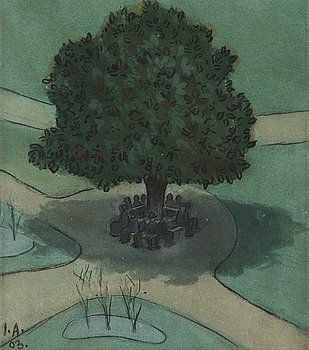 Maurits Cornelis Escher, ”Old olive tree, Corsica”. 339. Maurits Cornelis Escher, ”Temple of Segesta, Sicily”. 340. Maurits Cornelis Escher, ”Sun and moon”. 341. Maurits Cornelis Escher, ”Catania, Sicily”. 342. Maurits Cornelis Escher, ”Other world”. 343. Maurits Cornelis Escher, ”Drop (Dewdrop)”. 344. Pablo Picasso, "Femme nue assise et Trois Têtes barbues", from "La Suite Vollard". 345. Pablo Picasso, "Le Viol, IV", from: "La Suite Vollard". 346. Pablo Picasso, "Dans l'atelier". 347. Pablo Picasso, a faience plate "Tête de chevre de profil, Madoura, Vallauris, Francw 1952, A. Ramié 154. 348. Pablo Picasso, a 'Visage dans un ovale' faience dish, Madoura, Vallauris, France 1955, A. Ramié 273. 349. Pablo Picasso, a faience plaque "Profile de Jacqueline", Madoura Vallauris, France 1956, A. Ramié 383. 350. Pablo Picasso, a faience plaque "Trois personnages sur tremplin", Madoura Vallauris, France 1956, A. Ramié 375. 351. Pablo Picasso, a 'Poisson Chiné' faience dish, Madoura, Vallauris, Frankrike 1952, A. Ramié 170. 352. Pablo Picasso, a 'Picador' faience dish, Madoura, Vallauris, France 1952, A Ramié 160.